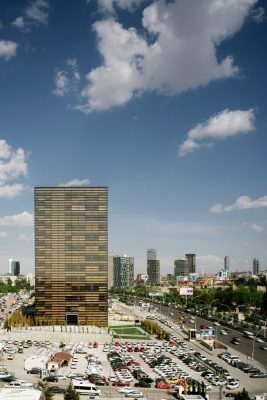 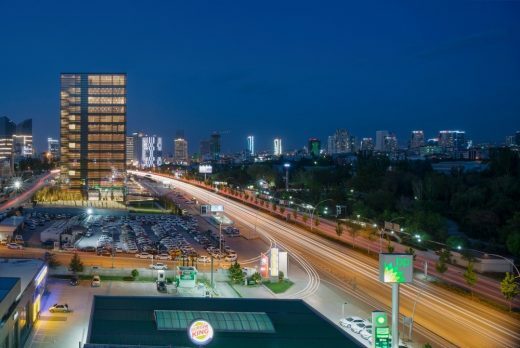 Urbanistically, the project plays an important role in a rapidly developing area west of Ankara’s old city center, knitting together a transit corridor, a pedestrian underpass, an emerging mixed-use neighborhood, and new commercial areas. 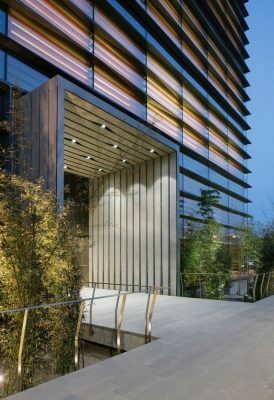 In response to this immediate context, the building is set back from the highway, making space for a bamboo grove that buffers a habitable urban garden and provides a much-needed pedestrian connection between the transportation node and the adjacent neighborhood. 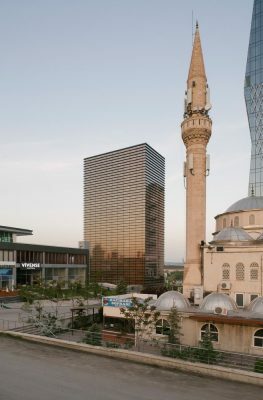 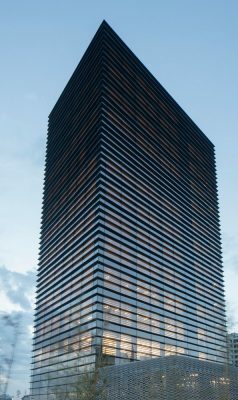 The tower itself is distinguished by clarity of expression: a simple, geometric glass volume encasing a stack of large scale, horizontal louvers, set in a lush landscape. 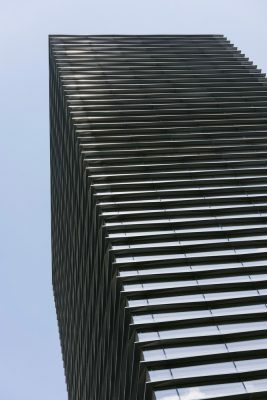 The Tower’s innovative cladding system employs horizontal exterior mullions with a variable section, to maximize year-round operational efficiency. 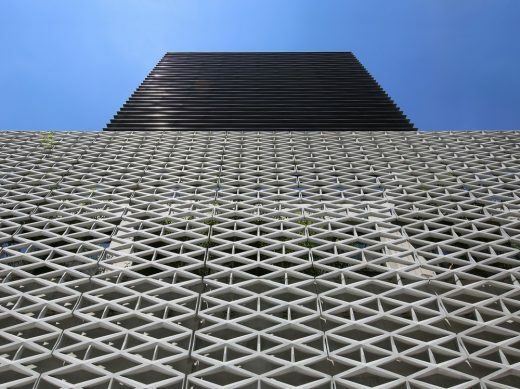 Their subtly inflected profiles successively shift as they wrap the Tower, creating a pattern that changes depending on the viewer’s perspective. 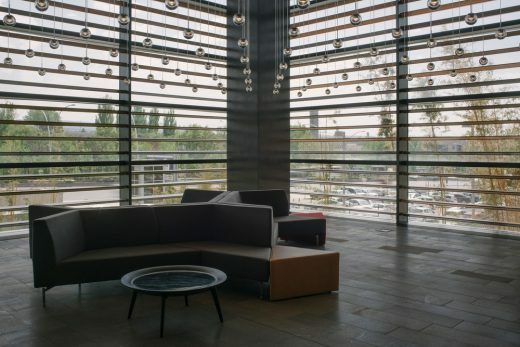 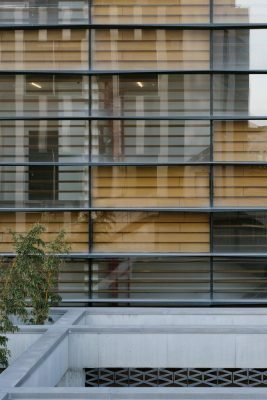 Interior wood louvers integral to the curtain wall—mechanically operated but with manual overrides—give tenants individual daylight control within their workspace. 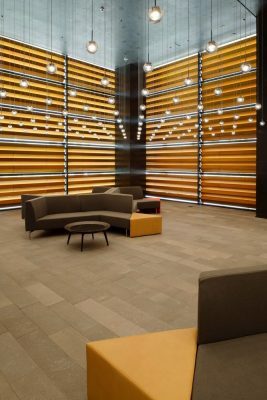 They mitigate glare, admit indirect light, and maintain views, while introducing wood’s warm, textural qualities to the office environment. 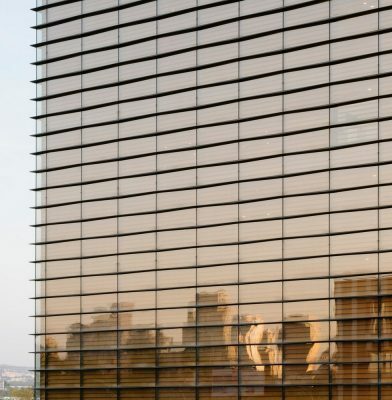 The outcome is a kinetic facade system that is environmentally responsive, satisfies the workplace preferences of a demanding tenant cohort, and enhances the project’s architectural impact and influence in a newly expanding area of the city. 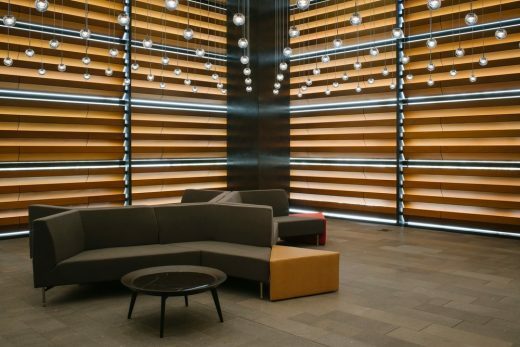 Over the course of the day and as one moves around the building, this innovative wall assembly produces a transformative effect, drawing the observer in and evoking curiosity. 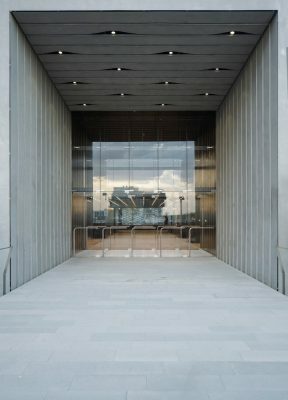 The exterior sculptural mullions create different patterns, depending on the sun’s position and the pedestrian’s perspective. 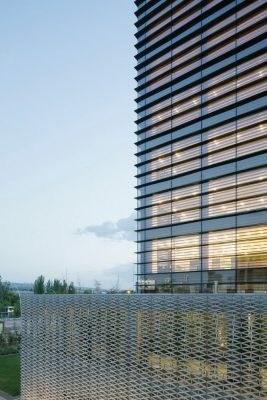 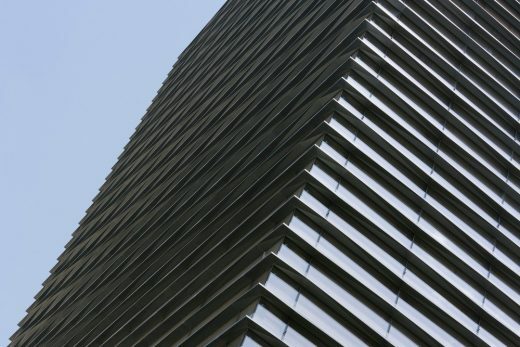 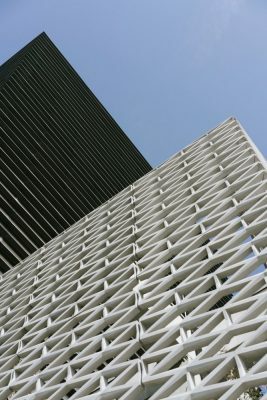 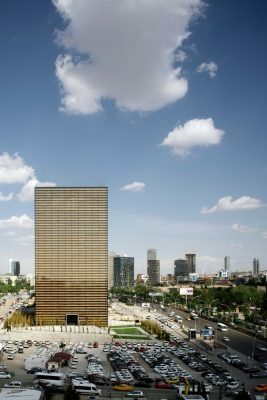 As wood louvers open or close according to interior needs, the Tower itself appears either permeable or reflective, revealing patterns of use and activity within. 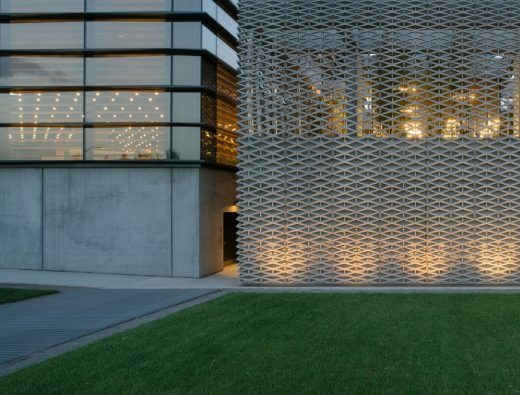 AW Architects is a highly collaborative, multi-disciplinary practice committed to design and construction innovation. 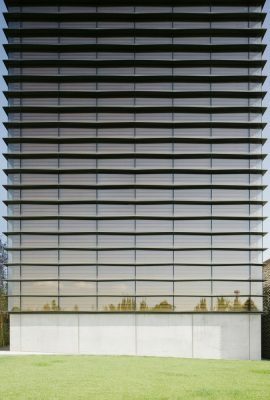 For more than twenty years, the firm has been producing acclaimed, innovative projects across a broad spectrum of building types, including complex commissions for private and public institutions, both nationally and overseas. 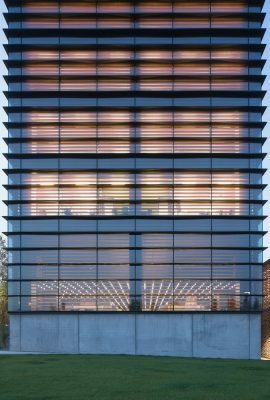 Recognized nationally and internationally, AW has been widely published in American and European media and has received numerous design awards, including the American Institute of Architects’ Honor Award for Architecture, the Society of College and University Planners’ Merit Award for Excellence in Architecture, the Chicago Athenaeum’s American Architecture Award, and the Boston Society of Architects’ Harleston Parker Medal.